This is an odd, but true fact. Another one you may not know, Ecuador produces a lot of cocoa beans, but because of the cost to run a factory, rarely is chocolate manufactured in the country. This month on my frugal travel destinations series, I’d like to talk about why Ecuador makes such a wonderful vacation stop and how it can save you hundreds of dollars off your normal trip for the year. 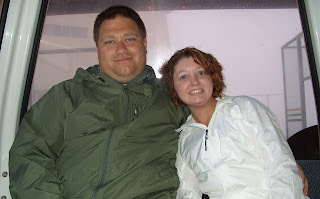 My husband and I traveled to Quito and some of the lesser known cities in 2008 and have put it back on the list for a future destination. We did have some obstacles on our trip, but that can happen most places (and probably has to us), so we forgave Ecuador and are willing to give it another go. Most people are interested in visiting the Galapagos Islands, which, while very awesome and educational, can be very expensive. Since you have to fly into Quito and then take another flight to the islands, that raises your airfare. Hotels and cruise tours are often much more than you would expect, because the tours are small and there are only so many boats and accommodations to go around. Meaning they can charge top dollar for these in-demand destinations. Now, I’m not telling you to give up on your dream to see amazing Darwinian creatures in your lifetime, because I have those dreams as well. We’ll just have to create a savings plan for such a trip. In the meantime, a nice trip to Ecuador’s mainland is a great distraction from our disappointment. There are many different landscapes to visit in Ecuador, from beaches to the rainforest to a thriving city. This can vary climate widely, depending on your altitude (which is very high even in Quito, BTW). If you aren’t doing serious mountaineering and the lowlands and valleys are more your speed – like mine – then you will have a nice tropical climate which is suited to wearing lightweight clothing, like t-shirts and shorts. Because of its location on the equator, Ecuador gets the same amount of sunlight all year round, so whenever you go will be exactly like any other time of year you go. You can expect sunlight from 6am to 6pm, which is pretty easy to get used to. If you’re visiting the city, be aware that almost all shops close down at nightfall. This gives you an excuse to go have dinner and relax before bedtime. Ecuador is one of those places that you can easily find deals, because the economy is not strong and very dependent on tourism (as well as their many exports). Airfare is really the only variable, so signing up for airfare alerts will get you the best fares. All over the country, you can stay in gorgeous hotels for a fraction of what you would pay in other countries. We found a lovely hotel in Quito (San Francisco de Quito) that was recommended by many other travelers, included breakfast and was right in the center of the city. We stayed for 6 nights for less than $250. They had a beautiful courtyard where you could sit in the sun and have breakfast, do some shopping or write emails on your laptop. There wasn’t a lift, which was fine, but if you take a lot of luggage, you might have a hard time. With the thin air and the possibility of being on the 3rd floor there might be a lot of stopping to catch your breath. The hotel has its own tour office and also a delicious restaurant. We made friends with the head chef and he gave us excellent advice and made us many great things from his menu. Oddly, it didn’t seem like many guests were taking advantage of the local food provided a few steps from their rooms. Even if you don’t stay at the San Francisco de Quito, I would suggest stopping by to eat here. The restaurant is called 1698 Camino Real. Make a reservation to go up on the roof to see the whole city from the “viewpoint”. We went at night and it was breathtaking…and not just because we had to climb up many steps and ladders! Taxis are amazingly inexpensive as well. After getting lost a million times in our rental car, we decided to take a cab on the last day to the teleferiqo (a crazy cable car that takes you to the top of mountain in the city and allows you to see all of Quito (and probably other cities). The cab ride would have cost us over $40 each way in the U.S. and other places we’ve gone, but we were charged just $5 each way, and that was the longest ride we’d taken. The teleferiqo is a must-do. If you get their earlier in the day, you may not have to contend with the fog like we did and you can spend the day at the Volqano Amusement Park next to it. If you’re afraid of heights, this may not be the attraction for you, but it is simply an incredible experience to travel almost straight up the side of a mountain. At the top you can buy souvenirs, take pictures, have a hot chocolate or just enjoy the view. You’ll never do anything like it again. Take a guided tour. We paid a very reasonable price for a half-day tour of Quito. It was just the two of us and our tour guide and he took us to the capital building, church, a museum and walked us along the street while giving us fabulous historical information about the city and answered our questions as well. Haggle! If your Spanish is passable, there are many shops that are not retail stores. They will haggle with you on prices to get you to buy more. This is how I ended up with TWO Panama hats and a handwoven scarf made from alpaca wool for much less than I would have paid at home for 2 baseball caps and a cotton scarf. While I got an excellent deal on them, I didn’t insist on prices that seemed crazy cheap, as I know a lot of people do. They depend on their sales to live, so even though I love to get a bargain, it’s sometimes just fun to interact with people. The retail shops are quite affordable as well. We did some shopping at a few grocery stores (which is always fun) and bought fun things like shoes and chocolates and coffee and other souvenirs. Near the end of our trip we stopped in one of the many jewelry stores in Quito and snagged a set of wedding bands for probably 1/10th of what it would have cost at home. Even with this purchase, we still ended up spending less on our vacation than others we’ve taken. 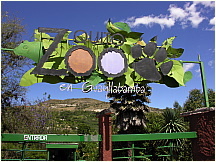 Guayllabamba Zoo – I’m always a sucker for a zoo or an aquarium and we visit them all over the world. Just 25 minutes out of Quito, this zoo has many different animals than I’ve seen at other zoos, including kangaroos and Galapagos tortoises. It’s a good walk and can take up 2-3 hours of your time, depending on how fascinated you become by new species or if you have children with you. You might even witness an alpaca break out like we did. Mitad del Mundo – It’s the middle of the world! Literally. Located on the equator, you can get your passport stamped here and witness the strange phenomenon that can happen there. Balance an egg on a nail, watch water run straight down a drain without a clockwise or counterclockwise direction and learn how your strength can be different on the equator than anywhere else. Even more things to see on the tour here, including the history on the natives of Ecuador. 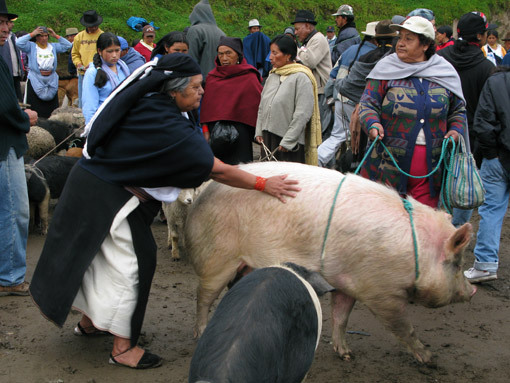 Otavalo Animal Market – You may find this a sad thing to witness, but it’s a fact of life in Ecuador. You need animals to farm and make food. An auction goes on here every weekend for livestock and on the outskirts, you can buy food from the cooking stalls or purchase handmade goods from others peddling their wares. After you’ve tired of watching American’s coo over baby ducks and pigs, walk down into main Otavalo for the street markets, where you can buy alpaca goods like sweaters and ponchos, Panama hats and also spices, flowers, vegetables and more! You can take a bus to almost any destination in Ecuador, but you will be on their schedule. If you prefer to rent a car, like we did, make sure to rent a GPS, too, if you don’t have your own with South American maps. Navigating the streets can be tricky and in some places, like Otavalo, many streets aren’t marked. In fact, we never got lost while driving between towns, but we got lost several times that cost us 2-4 hours each time. It was really frustrating. We could never find a street map and then when we did, it still only showed us the immediate downtown area of Quito. Finding a way to get onto the highway the right direction was another challenge. And if you do take a chance on renting a car, I would maybe rent it only for the few days that you want to do day trips, make sure you don’t park overnight on the streets in Quito. While there is very little crime in the city that involves bodily harm, thieves will immediately target any car left on the curb. There are many overnight parking lots that you can park in for very reasonable costs. We learned that the hard way, as our car was broken into the first night in the city, because the woman at the front desk must not have understood our question when we asked if it was safe to park on the street. We didn’t ask if it was safe to park overnight. Luckily, we did get a knock on our door bright and early the next morning to alert us and, even though it took most of the day to take care of, we were able to get the window repaired without much hassle or money. There is a very touristy beach area in the north of Ecuador, which might be more your speed. We didn’t make it that far in our travels, but might check it out on our next trip. Take advantage of affordable prices on lodging and try spending time in a mountain lodge. We did this in Otavalo at the Ali Shungu Mountaintop Lodge and could have brought 6 more people. Our “bungalow” was really a house and about the same size as our current one. 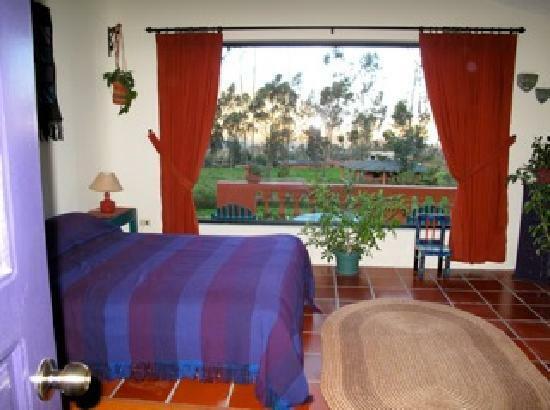 It had a kitchen and a huge dining room, a big bedroom with two queen size beds, a shower big enough for 5 people and huge picture windows to enjoy the view of the trees and other foliage. We paid about the same per night as you would for a regular room in a nicer hotel. I think at that time it was around $130/night and we stayed for two. The rate included 3 meals a day, free WiFi, a drive into the town to see the markets and horseback riding for one of the days. I really don’t know how many other places you could go that would have such amazing deals. While this isn't really a gadget, it's a must to get you ready for your trip to Ecuador if you aren't great with your Spanish. My Spanish Coach is an awesome language teacher that incorporates repetition and games to get you to remember words and also put together sentences. Great for kids and adults alike and you can easily take it with you on your trip to practice in your downtime and on your plane ride. That's right, we have another giveaway. This time, it's for a travel folding blow dryer. 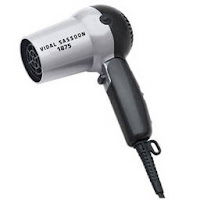 I know a lot of you like to take your hair dryer everywhere you go, now you can take up less space in your bag with this great one from Vidal Sassoon. It has two heat settings, a cold setting, dual voltage settings (so you can take it all over the world) and has maximum wattage, for maximum effectiveness! Enter to win HERE! Winner will be chosen on Sunday the 20th, so get your entries in now. There aren't many entries, so you have a good shot! great post! 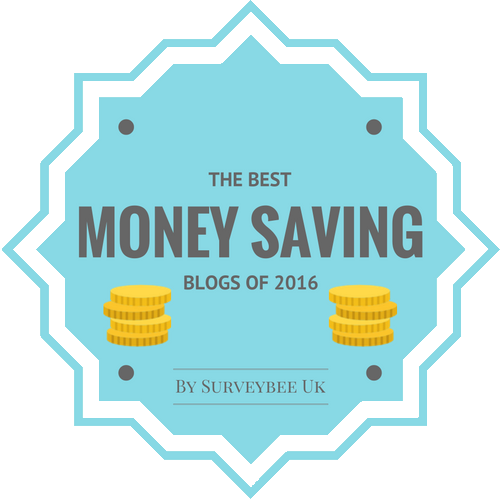 enjoyed my first visit to your blog. I am always looking for ways to travel cheap too. I am heading back to Guatemala in June, so look forward to coming back and reading your blog again soon for some tips and hints. I'm glad you found it useful Michele. Guatemala is on my list for this Frugal Vacation Series! You got any tips you can email me that I should include? :) Maybe we can each teach the other some good budget tips for the country! Following you on GFC and Network Blogs...please stop by and say hi and follow me too!